Here we go again, a new wireless standard merry-go-round is in full swing. If you were around for the 802.11n multi-draft incompatibility débâcle in the mid-2000s, then you'll be rolling your eyes to hear, if you haven't already, that all the networking companies are currently rolling out Draft 2 802.11ac kit. Thankfully we're jumping straight in at Draft 2, so this isn't as bad as the protracted 802.11n ratification process, but it's still not ideal. Once again we have a range of 'draft' products that aren't guaranteed to work at full performance with future ratified devices. What's worse in our opinion is that there's not a single device - laptop or tablet - that can work with these 802.11ac routers. No 802.11ac adaptors will exist until the end of 2012. So why would you even consider buying one of these products? Perhaps if you have to upgrade, replace or install a new wireless network, then it's a way of staying future-proof. The counter-argument is you're paying well over the odds for something that's going to be superseded pretty quickly, as we'll see. 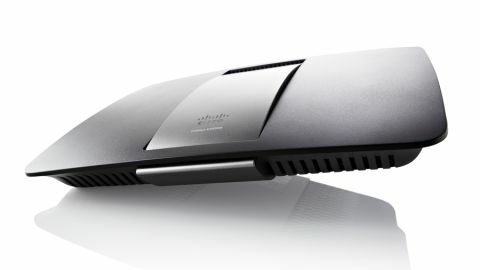 All of that is a general criticism of all Draft 2 802.11ac routers, not specifically this Linksys box, and we can't say any more than anyone else if they will or won't be fully compatible with future devices. So how does 802.11ac reach its maximum speed of 1,300Mbps and what's the issue with interoperability? While we're not expecting people to rush out and pick-up a physics degree or learn telecommunication engineering, the basics behind wireless communication are worth understanding. The big reason is that all the major standards, even from pre-802.11b, are based on the same principles and set of radio standards. It's the individual changes between each standard which increase speed, distance and security that make them interesting. So in the beginning we had the 2.4GHz wavelength. For the majority of the world it's an open, unlicensed frequency. Back when 802.11b was being set up at the end of the 1990s, outside of the US and Japan the 5GHz range required a licence, in other areas it was restricted for military use, both of which would delay release and greatly increase the cost. This changed in 2003 when the frequency was freed up in Europe, due to the increasing demands being put on the 2.4GHz range. Moving from 2.4GHz to 5GHz instantly brings a doubling in transmission speed. A more complex aspect of the technology is the multiplexing and modulation used to imprint the digital data on the waveform. With 802.11b, the most basic modulation is DSSS or Direct Sequence Spread Spectrum. It's very robust but awfully inefficient, with the modulation taking up more bandwidth than the data and limited to a maximum of 2Mbps. Faster 11Mbps transmissions were attained using Complementary Code Keying or CCK modulation, but that reduces the distance by a third. The introduction of 802.11g brought the grown-up Orthogonal Frequency Division Multiplexing or OFDM system. This is used by 802.11a, ADSL and a host of other digital transmission systems. This enables Quadrature Amplitude Modulation or QAM and for 802.11ac this is raised to 256-bits QAM from the 64-bits in 802.11n. A minimum of three spatial streams are also required and channel bandwidth has been bumped to 80MHz from 40MHz. All of that adds up to a single data stream at 433Mbps up from 150Mbps, and with three in use a total theoretical throughput of 1,300Mbps. Still being debated are a few performance aspects: options for 160MHz channels, support for eight MIMO streams, 'beamforming' that can direct a signal towards the target device and multi-user MIMO that dedicates antennas to devices. These optional features are a cause for potential issues with these early releases, so it's good to know about them. So what is the Linksys EA6500 packing? It has six antenna, so it's a full 3x3 450Mbps 802.11n 2.4GHz and 5GHz dual-band router with the added ability for 1,300Mbps 5GHz 802.11ac. There are also four Gigabit LAN ports, plus WAN and two USB 2.0 ports with printer, DLNA and NAS capabilities. Linksys says the internal 3D antenna array enables vertical or horizontal mounting. To partner this for testing we have the Linksys WUMV710 Wireless-AC Bridge. It also has four Gigabit LAN ports and a universally supported WPS button, which provides an effortless two-button-press connection with the main router. Installation of the router could have been a little bit smoother - we've seen this before, but Linksys seems to think people still have DVD optical drives and encourage you down that route, when actually all you need to get going is the IP address, username and password on a bit of card or hey, the back of the flipping router would be sensible enough. If it's not internet connected there's also a ridiculous error message generated by the Cisco 'cloud' service, apparently making life harder and more complicated. Minor quibbles, but still annoying. Interestingly, Linksys does supply an NFC card for one-tap connection of capable devices, which is very clever. There's also the obligatory phone app that does tie into the cloud service. The web interface is very friendly: it's split into obvious and clear sections, which can be customised via a 'widget' system. It's fast to navigate and changes to wireless settings are initiated in short shrift. There are basic parental settings but we're not sure how useful it is to have to manually enter the individual sites you want blocked. A guest network system is also offered. As usual the SSID can be split between the 2.4GHz and 5GHz bands, with either or both providing disable options. Up and running, this is the first 802.11ac router to truly impress. It's the first to get anywhere near delivering on the promise of 3x throughput by at least hitting 2x. It reached average speeds of 68.5MB/s upstream and 66MB/s down with peaks at 75MB/s, which is way ahead of any of the other 802.11ac routers we've seen so far. It also managed a very strong performance with its 802.11n 5GHz and 2.4GHz speeds with same-room downloads hitting 31MB/s and 23.9MB/s respectively - amongst the best speeds we've seen. So far this is the only 802.11ac router we'd think about recommending, but even so, unless you're convinced of the need to future-proof yourself we'd hold off at least until laptop and desktop adaptors have made an appearance. The standard isn't due to be officially signed off until 'late' 2013 and who knows if that will slip. At £199, this, like the Netgear R6300, is one of the most expensive of routers on the market, and if you can't fully use its features because there are no compatible devices out there - you know, just that minor problem - it's a really hard sell for the home buyer. But, almost across the board, this the fastest wireless router we've tested at all standards. Good work then Cisco!